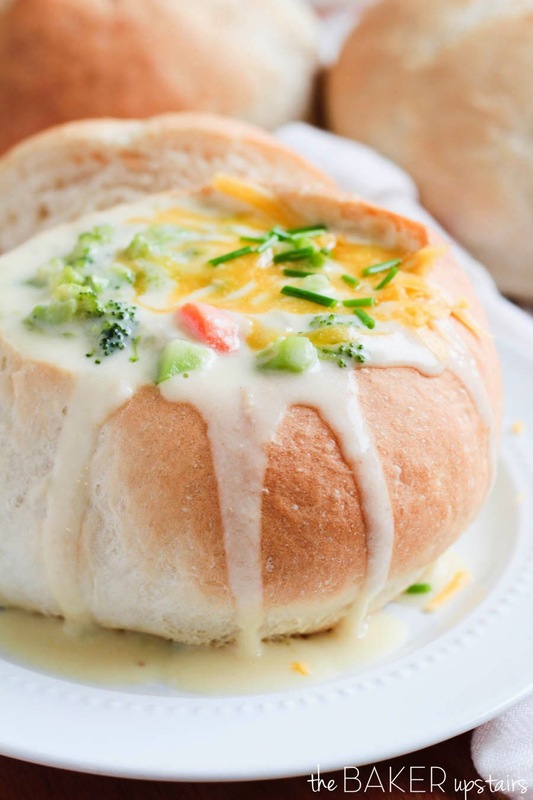 Okay, now that you've made your delicious bread bowls, you need something awesome to fill them with, right? 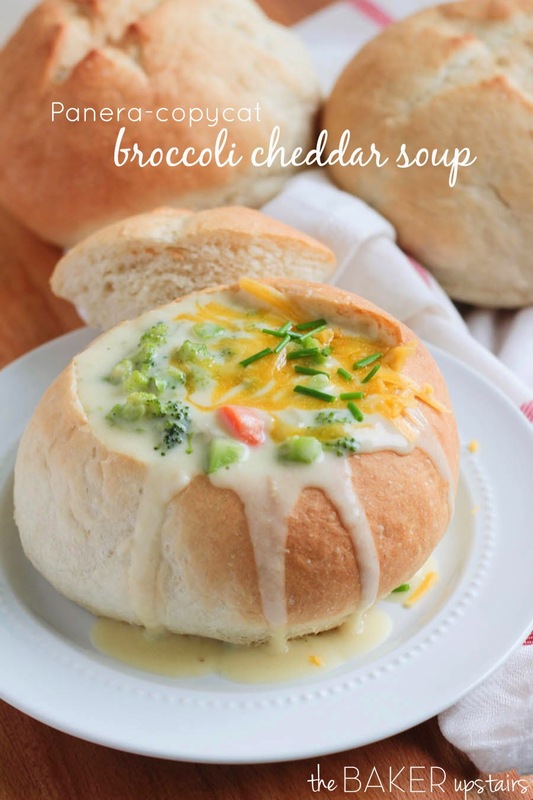 Enter this super delicious Panera-copycat broccoli cheddar soup! I went to Panera for the first time on our trip to San Diego in March, and it was love at first bite. 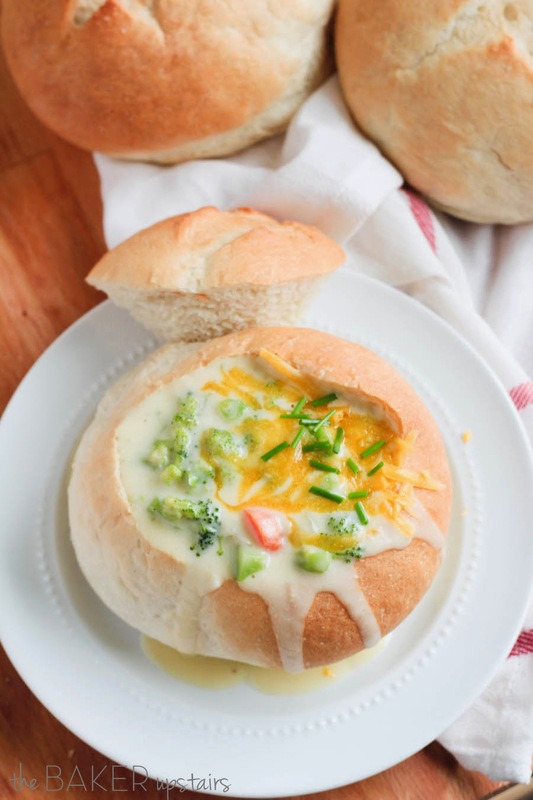 Their broccoli cheddar soup is out of this world, and their fresh bread is seriously the best. I loved it so much that I made Geoff drive back there again two days later, even though we had a list of nearby restaurants we wanted to try and the closest Panera was 20+ minutes away from our hotel. It was so worth it, though! Since we got home, I've been dying to try that soup again, but sadly the closest Panera is over 500 miles away (boo!). I was super excited to find this recipe so I could make it at home! I can't say with 100% certainty that it is exactly like Panera, since it has been two months since I had it last, but I can say that it is incredibly delicious, and the best broccoli cheddar soup I've ever made. And when served in a freshly baked bread bowl, it's pretty incredible. It's comfort food at its finest! In a large pot over medium heat, melt the butter. Add the onion and garlic, and sautee until softened and fragrant. Slowly add the cream, milk, and chicken stock, and stir well. Add the corn starch to a bowl and add enough water to cover. Whisk with a fork until the corn starch is dissolved and the mixture is smooth, then add it to the pot. Add the nutmeg and cook until slightly thickened. Stir in the carrot and broccoli and simmer until tender, about 10-15 minutes. Remove from heat and stir in cheese. Add 1 teaspoon salt, taste, and add more as needed. Serve warm sprinkled with additional cheese.